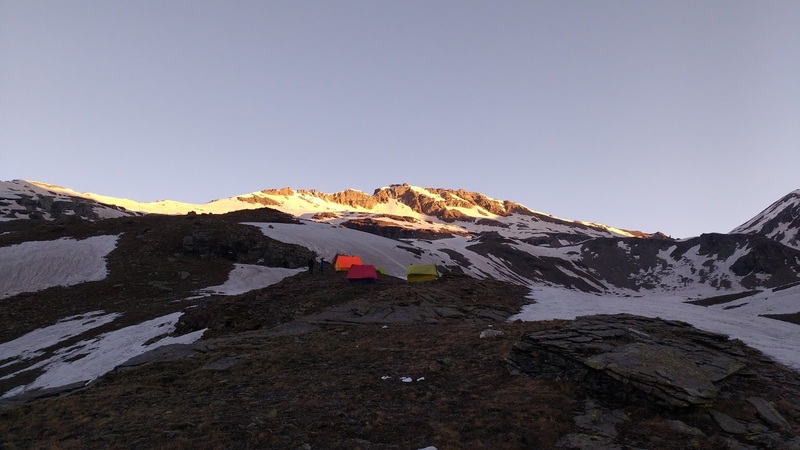 Despite the biting cold, it was at the final camp before the Rupin Pass ascent that we really let ourselves go. Snow extended beyond our sight and after a heavy lunch, everybody got to sliding down slopes, making snowballs and having a wild time. Soon a mega snowball throwing battle ensued and livened up the afternoon, with no two distinct sides. Almost everybody was aiming for everybody else. By early evening, we were icy wet, cold and wrapping ourselves in layers of sweaters and jackets. Extra servings of masala noodles made up for the chilly evening. The sunlight honeyed over the snow the next morning, it was simply another splendid day for a trek! The organizers provided each one of us with a pair of crampons as an extra grip for our shoes. 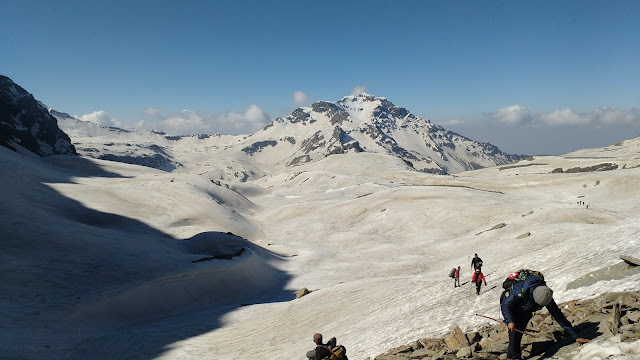 We began closing in towards Rupin Pass with a collective steadiness. This was the longest stretch of snow we had to tread on so far and it took that additional bit of effort and time. Nothing prepared me for the actual summit climb. I didn't know what to expect, despite having checked the Internet (prior to the trek) for detailed images. Our group awaited our turn to make a beeline for the final climb, while another trekking group went ahead. Before proceeding, the leader of that group was delivering no-nonsense instructions in one loud monologue. "Hold the trekking pole in your right hand.Take one step at a time. If you fall, fall alone, don't hold on to the person beside you, don't fall over the person behind you. OK? Let's go!" Overhearing that conversation gave me the first hints as to what lay between the two vast expanses of jutting snow-smothered rocks. Surely that man was exaggerating. 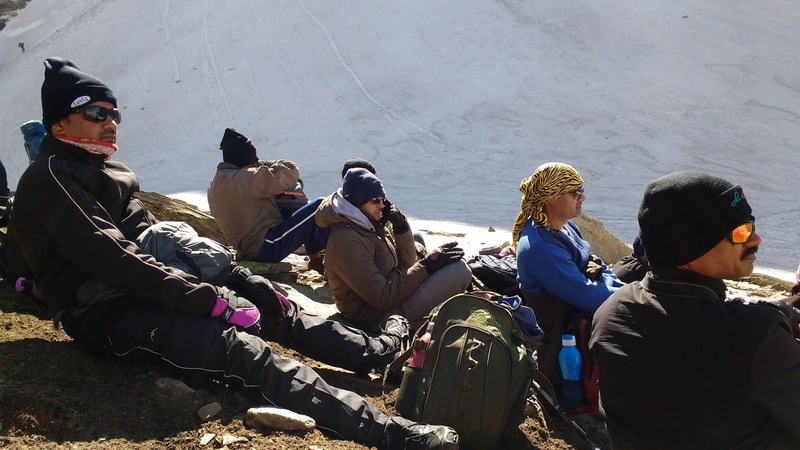 I thought he was basically creating an atmosphere of caution among his group of trekkers. We were soon to find out for ourselves. I realized then that this epic trek had been so immensely enjoyable because I had not thought about tomorrow or even the next hour for one instant. It had been about taking the next step and nothing else. I tell you, walking in the mountains for over a week changes you, you will never be the same again. 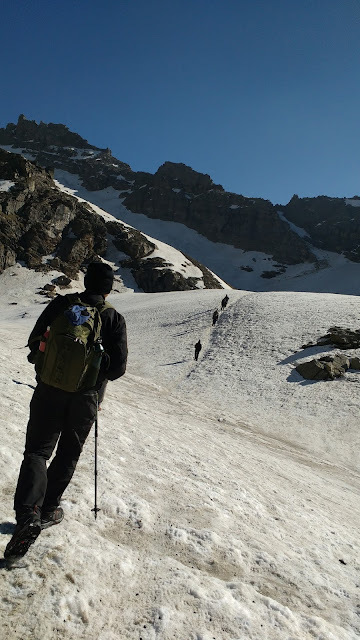 Either you will heed the call to climb the mountains again, or return resigned to your dreary habits and to habitats that we call the cities of India. Among the traffic, chaos, smoke, population crisis, corruption, greed, grime, and carbon soaked air, you will then long for the mountains and suffer. Suffer then and suffer well. How else will you make it to the mountains again, but with that huge bullet-holed memory in your heart? How will you make it again, but with that desire for deep, eternal calm?